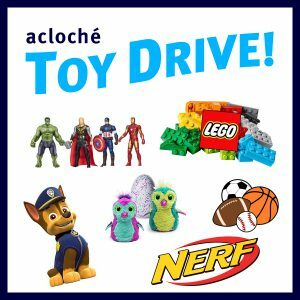 Each week in 2018, Acloché has participated in our 50 for 50 campaign, which celebrates our 50th year in business by performing 50 Acts of Gratitude. These Acts include things like holding food drives, hosting free seminars for the local business community, hosting employee appreciation events, and anything else that shows our gratitude to those who have supported us over the years. Well the month of November is officially in the books, and we have wrapped it up with a very special Act of Gratitude—an act that our recipients think is pretty sweet! 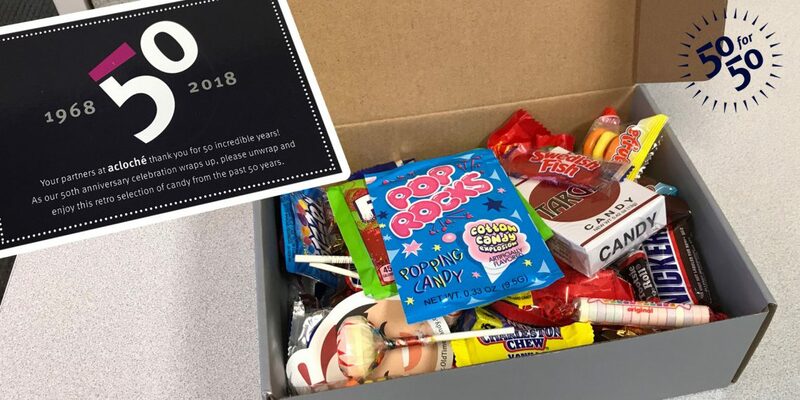 As a thank you for their partnership and support, Acloché gave a box of retro-themed candy to each of our partners, including treats from the past 50 years commemorating our 50 years in business. Each box was adorned with an appropriate message: “As our 50th anniversary celebration wraps up, please unwrap and enjoy this retro selection of candy from the past 50 year.” Our partners were pleased to find a wide variety of their old favorites in each box! Help support those in need this holiday season by swinging by your nearest Acloché and dropping off new and unwrapped toys for boys and girls of all ages! Click here to learn more about our 50 for 50 campaign and to read about last week’s event, and check back next Friday for an update on our 50th anniversary celebration!